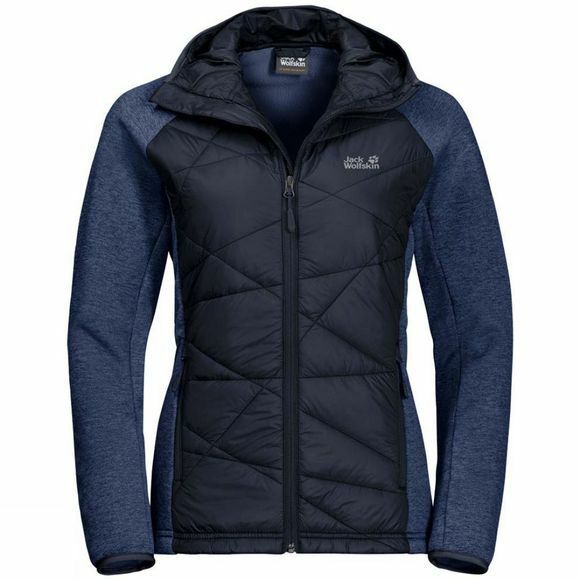 The Womens Skyland Crossing Fleece from Jack Wolfskin is very breathable and gives you protection from the cold and Wind where you need it most. Which makes it perfect for runnIng and other energetic Outdoor sports. It also features a Windproof Hood to keep your head warm.If there's a cold headWind blowIng when you get to the top of the Hill your core stays nice and warm, because the front of the Jacket is Windproof and Insulated. The sleeves and back of the Jacket are made of an extra breathable, Stretch Fleece fabric for maximum freedom of moveMent and superior wear climate. And if you work up a sweat, all the fabrics In the Jacket deliver effective moisture management–to enhance your Comfort and improve your physical performance.